La Fura dels Baus returns to the Salzburg Festival after 20 years (for the first time in 1999) with the opera T.H.A.M.O.S., based on a didactic play by Tobias Philipp, Baron of Gebler. Padrissa’s interest is aroused by the optimism of the 17-year-old Mozart, in the spirit of the Enlightenment. The drama is set in the spectacular city of Heliopolis, in 3000 BC – but with modern technology. La Fura dels Baus reinvents Thamos by Mozart as an opera for the first time in histori. It will be next January 24 at the Felsenreitschule auditorium in Salzburg (the hometown of the composer) as part of the Mozart Week organized by Mozarteum. In will also be performed next January 28 and February 1. Carlus Padrissa will perform the piece some scenes of The Magic Flute and an algorithmic soundtrack composed by Urbez Capablo. An spherical immersive show about the liberation of the new slavery forms of this century. Mozart loved the theatre – in all its forms. Tobias Philipp von Gebler’s didactic play Thamos, King of Egypt revolves around Egypt, freemasonry and the Enlightenment. Mozart was a man of the Enlightenment and the freemason’s lodge he belonged to was not an esoteric but an intel lectual one. The music he wrote to accompany the play is not amongst his best-known works, but it is among his most extraordinary achievements, and it gives the main role to the chorus. The idea of staging Thamos with his fantastic troupe La Fura dels Baus inspired Carlus Padrissa to develop his own new play from the score. It is a spectacularly dramatic and theatrical journey, interweaving dance, new passages of writing and Mozart’s score, to which arias from other works have been added, sung by three soloists. A conductor from Mexico, a soprano from Egypt, a tenor from Thailand and a star bass from Germany are accompanied, as if this were nothing out of the ordinary, by the Salzburg Bach Choir and the Camerata Salzburg. Music brings people from all different cultures together, and Mozart knew how to do that better than anyone. 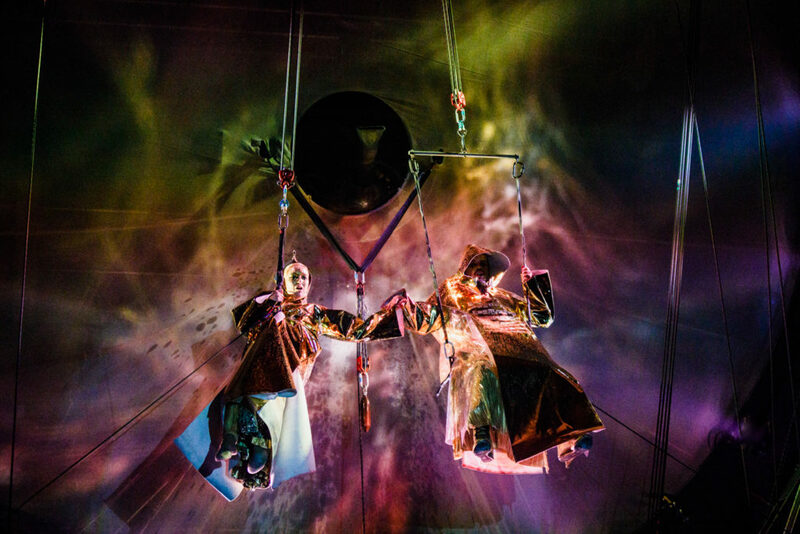 Padrissa presents the Thamos of Mozart, according to La Fura: T.H.A.M.O.S.. A surrealist and immersive light experience between new future passages. A pyramid in the center of the Earth, with tunnels that connect Egypt, Thailand, Mexico and Switzerland. The human being has not been able to control the energy of nature. As the inventor Nikola Tesla said, who starred in numerous inventions in the field of electromagnetism in the late nineteenth century, «When the human being will be capable of controlling all the natural energy, it would be released from the new forms of slavery and become an absolute artist». And will be then when art will be everything and everything will be art.